A super-cute, hand lettered birthday card designed especially for your bestie! This sweet card would make the perfect birthday card for that total babe in your life! 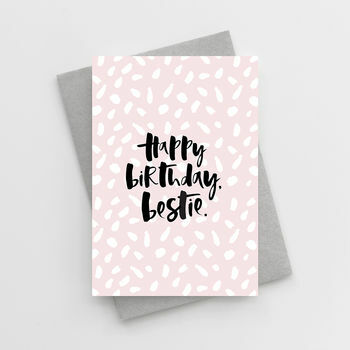 Featuring our classic, hand lettered typography, the phrase 'Happy Birthday, Bestie' is written in deep black ink, layered over a soft, blush background and finished with a modern, hand illustrated pattern. 'Happy Birthday, Bestie' Birthday Card is 10.5 x 14.8cm (A6) and comes with a 11.4 x 16.2cm (C6) envelope.